The first game that I blogged about, back in January 2010, was a refight of Marathon. 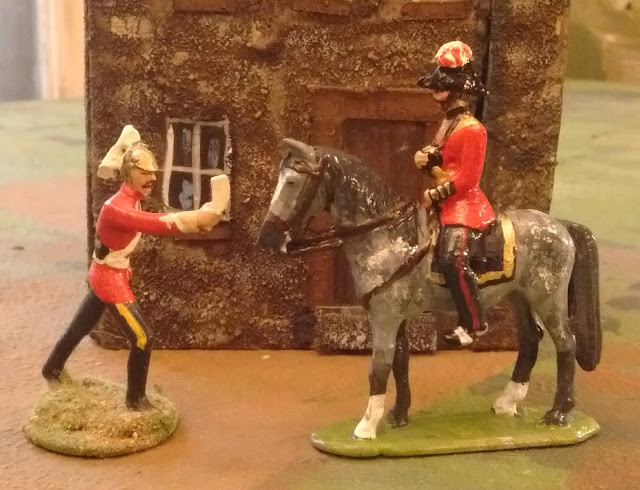 In the lead up to the game I included a post about my earliest inspiration (click) , the book Stories of Great Battles by Robert Webb. The 1st chapter, called "Rejoice! We Conquer! ", was about Marathon, the 2nd, called "Fierce, Huge and Bloody", was about Chalons. I couldn't help but think about that old book as well as Hal Foster's Hun Hunter episodes of Prince Valiant while looking at my newly expanded "horde" of Elastolin Huns (ok 2 dozen but still, lots of fur). Now as it happens, a copy of Simon MacDowall's new book on Chalons (Catalaunian Fields ad451) is currently en route to me. Its over 40 years since Simon & I cut our wargaming teeth on WRG 3rd ed and knowing him I don't expect his version of the battle to resemble my childhood one. Still, taken together, it just seems like a good time for some Elastolin Roman vs Hun skirmishes with Gothic and other allies (Vikings, knights and others) for both sides. Fur bikinis and a BBQ, what more could one ask? At the very least it will get a game on the table while I decide what to do with the enlarged collection in the long term. A horde of 4cm Veteran Elastolins reported for duty today. Romans, Huns, Vikings, Prince Valiant & medieval figures and siege equipment. Rather unusually I found myself in a position to take advantage of a chance to aquire a collection of Elastolins from the friend of a friend who was having to downsize things. 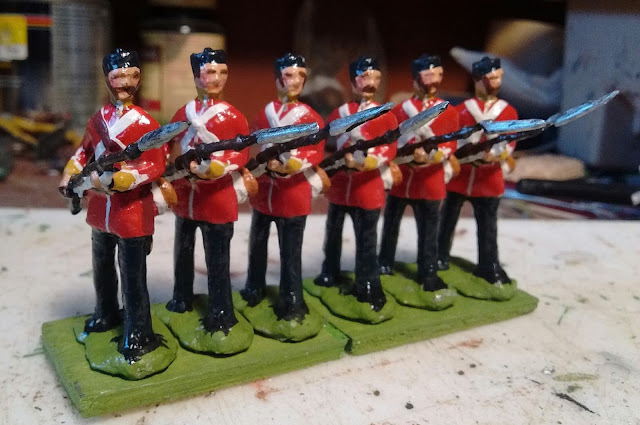 Now strictly speaking, having finally had the chance to scratch my elastolin itch over the last decade by picking up a few here and a few there, all I really needed a was a couple of mounted knights. I didn't need to double my collection but sometimes the self indulgent thing is also the right thing to do. I hope the joined collection also finds a welcome when the time comes. I'm fairly sure I don't want to run solo Medieval Mayhem games with 300 figures on the table so I'm considering my options. The late medieval figures and handful of landsknechts will join the 40mm Gathering of Hosts crowd on their 6cm square bases and Prince Michael and Hengist and their friends will stay on single bases in their setting. What is up in the air is whether I should pursue an OS massed combat system for single figures with Prince Michael crossing to the continent to fight the Huns and their various Germanic barbarian allies or whether the Huns should be the nucleus of an element based Gathering of Hosts army. The other question is how long until the siege equipment meets a castle wall? Spring Offensive - Stuck in the Mud! Its been 4 days since I played this game but feels like 4 weeks. Just been that sort of 1/2 busy, 1/2 lazy, March, got the "Not-Quite-Winter-Not-Quite-Spring Blues", week. I didn't take many pictures partly because I knew they weren't likely to come out well, partly because I was too busy with the game. Lowering the table to tripod height is near the top of the Toodoo list. Long Li goes "into battery" on South Hill and opens fire in anger for the first time. 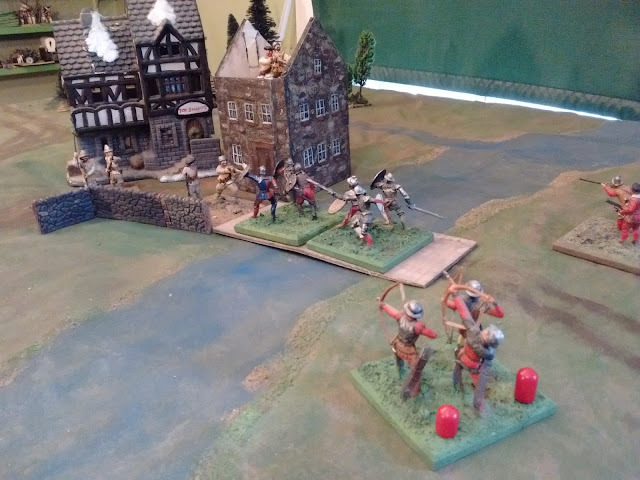 I started off with the intent of just adding a few units and playing the Great War game again but I have been wanting to do a game with more of a Wellsian/Little Wars look so some Red Coats came out and the next thing I knew I was back in the 80's in Oerberg with blackpowder breechloaders even though I've been promising myself that I would wait until I had a proper Oerberg army painted up. The scenario was the same but the arrival dice and programmed instructions led to a rather different battle even allowing for the difference in troop types. Red (aka me) came on on turn 2 with everyone on the South East Road. 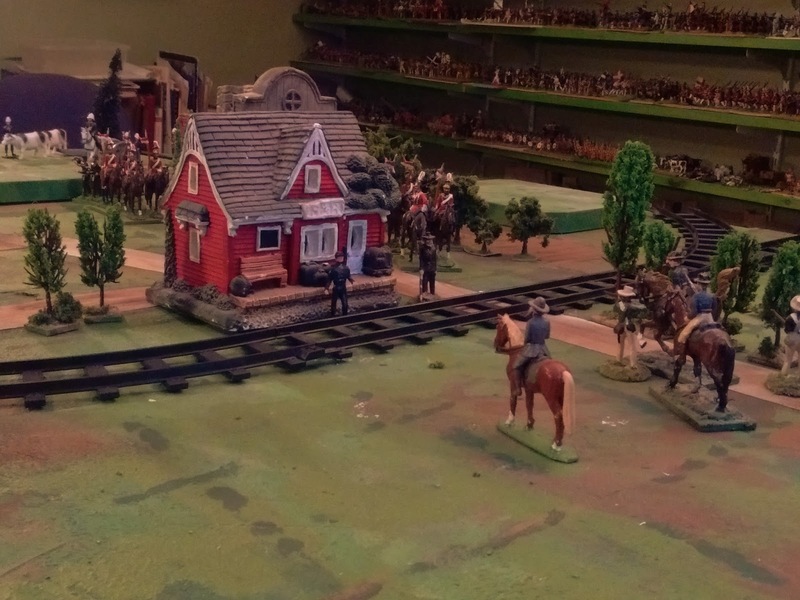 I had with me, 6 units of infantry, 2 of cavalry, a gatling and a 4.7" gun. Blue (programmed) came on in 2 columns, The first column, 3 Mounted Rifles, 2 Infantry, and 1 gun (Long Li finally making its debut in battle) marched on the South-West road on turn 4. The second column with 1 cavalry, 2 mounted rifles, 1 irregular infantry and a PomPom came on the North-West Road on Turn 5. An unscheduled reinforcement of irregulars showed up soon after. (chance card). Blue's programmed orders were to ignore the crossroads and seize the high ground dominating the roads. Red retakes East Hill leaving an isolated unit of Oerbergers cut off behind them but the flank is not yet won and the heaviest casualties on both sides are yet to come. The first couple of turns went by peacefully enough with lots of "tramp, tramp tramp" soon punctuated by the "crack,psssww...Boom!" of two heavy guns and finally a spatter of rifle fire on the Eastern flank as some mounted rifles seized the hill overlooking the town and engaged Red's infantry. The battle on the east see-sawed back and forth for about 6 turns before Red's infantry and the gatling finally drove the Oerbergers off despite suffering heavy casualties themselves. 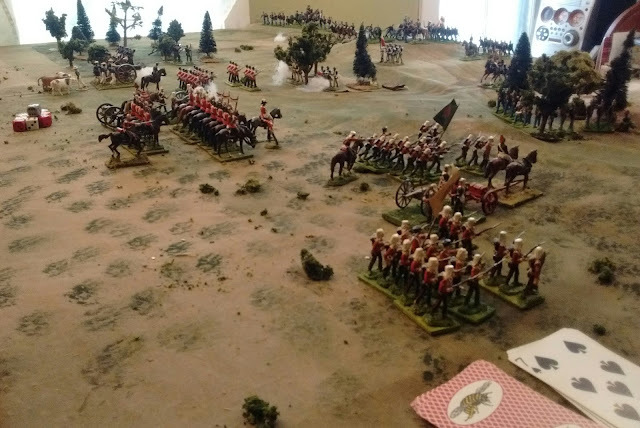 The Oerberg infantry had come forward in support but were eventually driven back by rifle fire from the Victoria Rifles ensconced in town, later supported by the Gatling and some artillery fire. By turn 12 the Western flank and center were secure but the battle wasn't over. 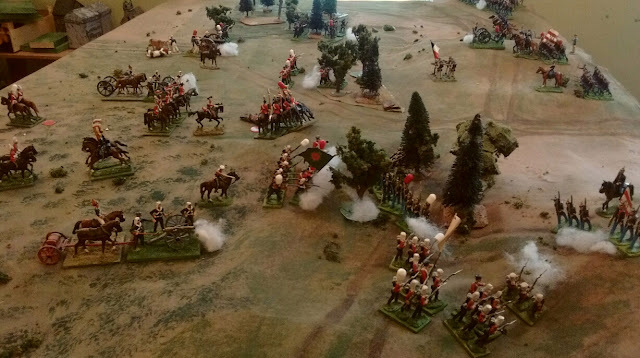 It took a while longer for the battle to get going on the Western flank. Oerberg's Atlantican allies rapidly seized the astern Knoll and repulsed a rash charge by poorly supported Queen's Lancers but they made no headway against the supporting infantry in cover until the Pompom and irregular infantry came up. Just as Oerberg's morale was failing with Long Li driven off the hill by counter battery fire and most units having taken too many hits, another chance card gave them a lucky boost and 6 units got to recover a hit. It was enough to launch a new offensive which came close to cracking Red's morale. In the end though the combination of hard cover and the ability of the regular infantry to take hits saw them through and by turn 15 Blue was in full retreat. An overview around Turn 12, just before the final attack on the station. This game did confirm several issues. 1) The Square Brigadier rules (under a new name) will work for the late 19thC and the early 20thC. 3) I still have too many different collections that allow me to play the same games but with different uniforms which is something I wanted to minimize if not avoid. 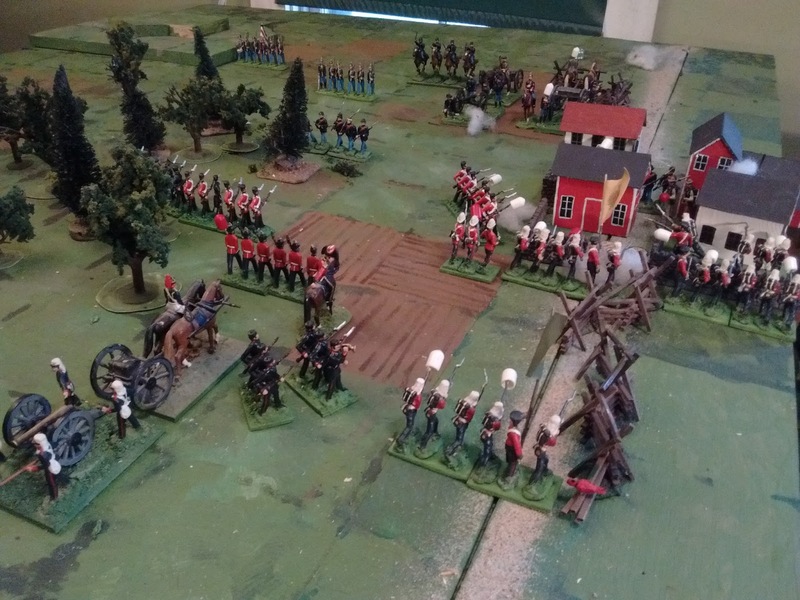 If I dropped the later troops and the 54's and the 1/72nd ACW, I could do all of the games I want with the 1860's troops from Colonial skirmishes between small forces to divisional sized battles or larger but that's not in the cards. 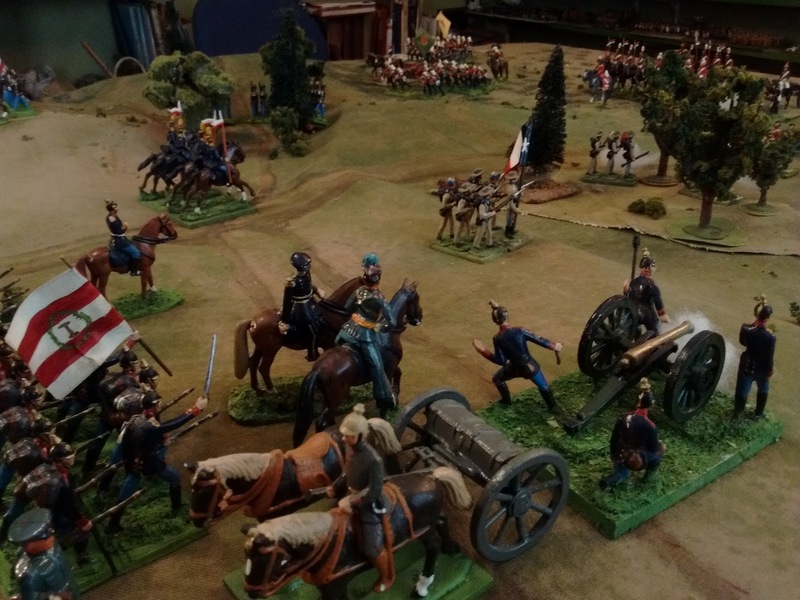 The closest to an answer at the moment is to focus the 1/72 ACW collection towards Corps sized battles including historical ones, focus the 1860's 40mm Atlantica forces on Divisional sized battles including some with European vs native armies and combine the Red/Blue Coats and the Drab uniforms and set the low level games in that turn of the century Wellsian setting proposed last year, tank and all. More on Spring plans and something new in a few days. No time to play today so the refight will happen Sunday as Spring arrives in Oerberg. Hmm, upon reflection I suspect that the veiled cultural (sic) reference to Uncle Joe and Petticoat Junction might be a bit too obscure for many readers but if so don't worry about it, just time and place is all. I had time for a quick game today. I decided that it was time to get back on the grid and to deploy some toys that had been idle too long. Green arrives on turn 4 to find Grey already deployed. 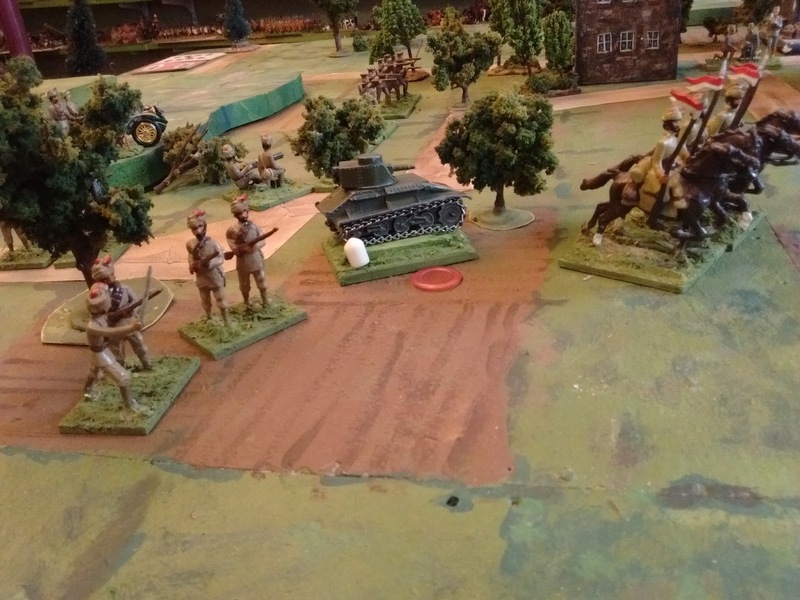 The choice fell on the Great War and the as yet untested Dinky Light Tank. Since the setting is several decades too early, I just classed it as an armoured car. After all I was actually looking for an affordable 1/43 Rollsroyce when I stumbled on this and couldn't resist. I was in the mood for a meeting engagement and almost set out Sawmill Village when I remembered Crossroads from Programmed Scenarios which I have rarely if ever played solo. The rules were the Square Brigadier. 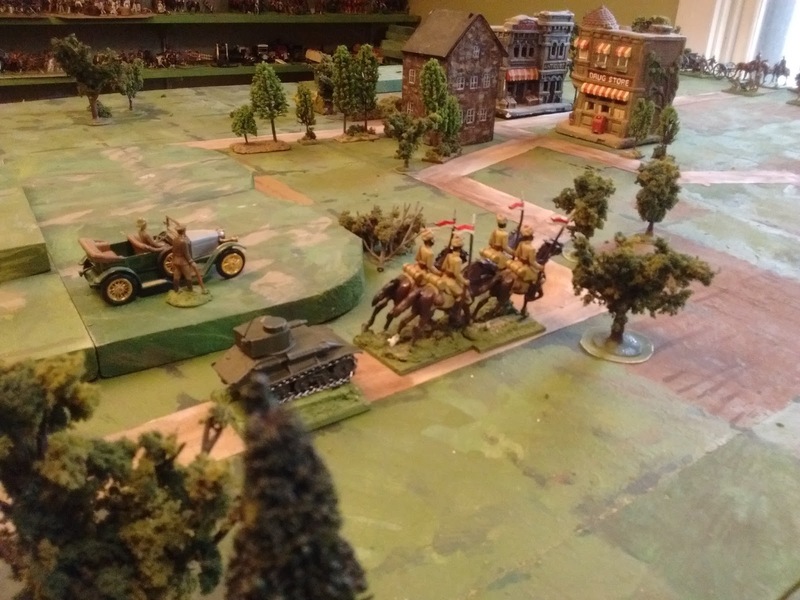 I took command of Green Force with 1 squadron of cavalry, 1 Armoured car, 4 infantry companies, 1 MG company, 1 Mountain Battery and 1 Field Artillery Battery for a total of 9 units, all arriving on the West Road on Turn 4. Grey Force was programmed. The dice indicated that a column with 1 cavalry squadron, 2 Jaeger and 1 MG company and 1 Field Battery would arrive on the SouthEast Road on Turn 3 while another squadron, 4 companies of infantry and another MG would arrive on the Southwest Road on Turn 5. Their orders were to deploy before advancing. ...hmm..wait a minute! They had 2 more companies than me! I thought I fixed that but the sneaky buggers fooled me and snuck 2 companies back in! No wonder I was having a hard time. Steel plate helps but its not invulnerable, especially against artillery and machine guns. The Dink pulls back to regroup. It took about an hour of alternating hope and fear to play the game to a draw. 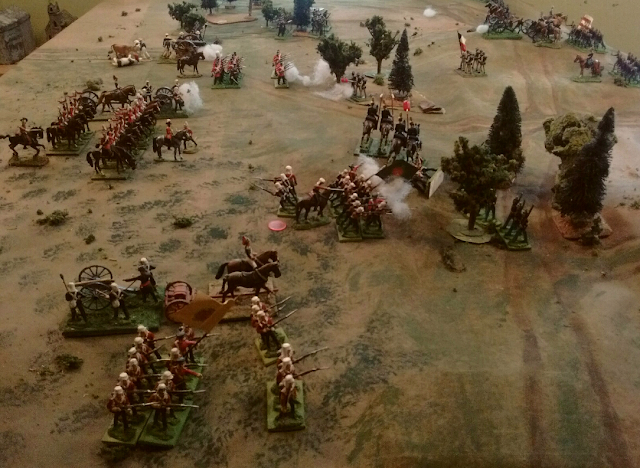 I really could have used at least another battalion a side and a few more turns.... but this was exactly the sort of quick affair that the Square Brigadier was meant for though and I like how the grid and rules work for this period and scale of game as opposed to earlier horse and musket era battles. I rather like The Tin Army name though. I should make sure there is still a written copy of the 20thC version as played today though since I went entirely by memory. Turn 15. Grey has taken heavier losses but isn't broken. Control of the crossroads and its approaches is still disputed. A hard fought draw then. This cries out for a refight before I rest the table. Not sure yet if I want to add a few more troops and a few more turns then play again or bring out another set of toys that need exercise. 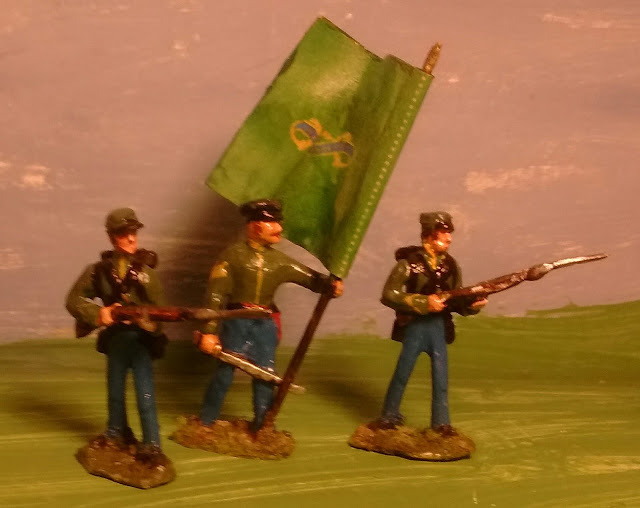 In the wake of recent defeats (not to mention the trouble caused by having so many unemployed discharged soldiers hanging about) the Oberhilse High Council has authorized new regiments of volunteers to replace the recently disbanded 2,3 and 4th regiments of the Oberhilse Field Force. The cadre of the new Irish Battalion of Volunteers. (and wannabe Irish) who celebrate the event. And with Spring, comes a little bit more variety. In honour of their role in last May's victory, HM King Michael of Rosmark has authorized the addition of a Grenadier company to the Pandours who will henceforth be known as The Border Regiment. I didn't do quite as much painting and playing as I'd planned over the winter but overall I accomplished more than hoped for since things have finally fallen into place after 7 years of searching, pondering, probing and testing. I'm expecting a busy painting and playing season ahead but there are still 3 days of Winter left so still time for another game or two before the Winter Campaign Season ends. For this game I took advantage of Grant's Programmed feature for the Blue army. 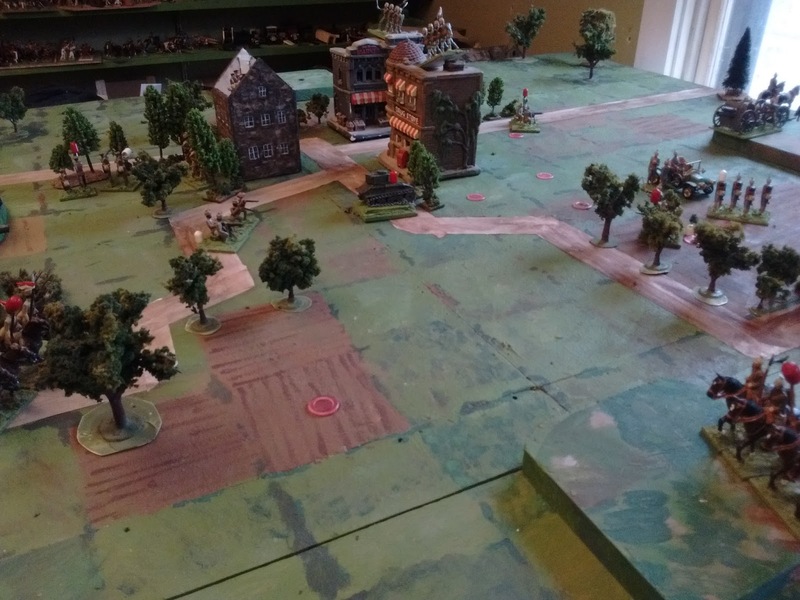 The first step after rolling terrain and laying it out as a compromise between what is now painted on my cloth and the maps in the book, was to roll to see if I had bothered to reconnoitre (I'm always embarrassed on my General's behalf if I fail the roll). General Milne may be new to the job but was obviously well schooled. This means I got to look at Blue's initial deployment and then deploy my troops before the start of the battle rather than marching on in road column. I then rolled up an even deployment for Blue with only cavalry and skirmishers allowed to deploy off the hills. After a brief study of the ground and mission General Scott began on his right by deploying 2 companies of the 1st Infantry and a rifled gun on West Hill figuring that the rifle had the range to bring a bit of crossfire to bear fire through the gap between the large Westwood and the smaller copse in the centre. In the centre, 1 company of Oerberg Volunteers was deployed forward with the 2nd company and a smoothbore gun in support with the gun deployed to shoot straight through the gap. On his left flank he deployed 2 companies of the 7th Infantry in the wood with 1 company in support on the hill. He posted 1 squadron of cavalry on each of the 2 road exits on either side of the Centre Hill and held 4 companies of the Blue Guards as a reserve behind the centre. My victory conditions were to seize the high ground dominating the road exits before dark. (Turn 15). Pondering this, the terrain and Blue's deployment, I decided to attack up the right with a pinning attack in the centre while holding my rifles back on the left to support my heavy gun and threaten his right should he withdraw troops to the centre. On the right were the Tigers with a gun then the Buffs. The cavalry covered the centre and formed a reserve. To their left the Volunteers supported by a gun advanced against the Copse while the ox-drawn heavy naval gun advanced up the road on their left to bombard the central hill, supported by rifles in the 10 Acre Wood. Then I rolled for Blue's battle plan which turned out to be "Hold all the hills, Don't counter-attack off the hills," I flipped the first card and the game began. Right away, the Tigers who were spearheading the attack and who had the longest way to go were immediately hit by a Chance Card which delayed their arrival by a turn. (No move). However, when my new heavy naval gun (Meg) opened fire on Blue's battery, she scored a hit with her first shot "Huzzah!" In the background, how I pictured the reaction to Meg's hit. A reprise of a 2015 photo of a mock up while planning Meg. It wasn't quite as smooth as Milne and I were expecting. Apparently Blue's infantry had built some sort of bulletproof defences in the wood and marked the ranges carefully since they were shooting down redcoats in droves while taking almost no hits at all from the return fire from rifles and grape. Milne had decided that there was no need for the cavalry to ride forward close enough to get shot at as there seemed little chance of Blue moving forward into the open. I mean, who in their right mind would throw a single, unsupported, squadron of lancers into the midst of the enemy army? Especially if (as his spies informed him) they were on hold orders? 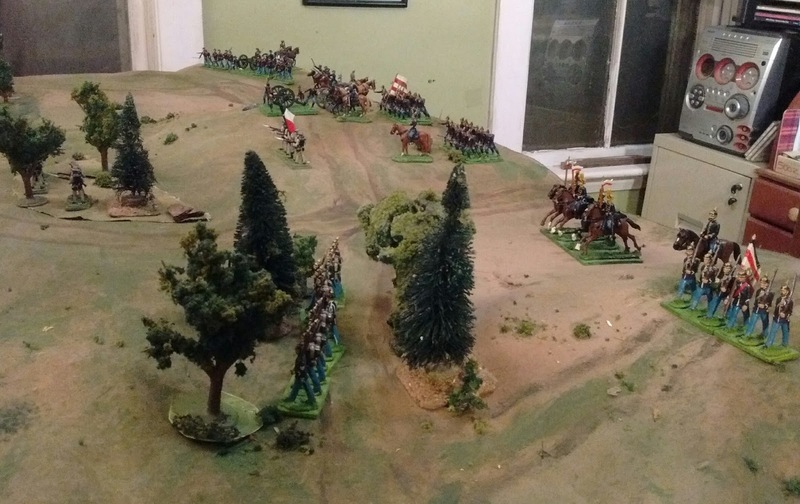 As the Buffs were pushed forward and prepared to pull back their skirmishers and charge into the wood, Blue hauled out the scenario book and checked his options: "Troops can't counter attack off the hills". His cavalry had been purposefully left of the hills, as allowed by his deployment, so they were not constrained! But they were just an inch or 3 too far away. I pulled the next card. Black King. Oh look, Blue goes first AND gets a free movement bonus for 1 unit. Sighhhh. The Blue Lancers crashed into the skirmish line and pursued into the main body. Brigadier Stoneforte had to steady the Buffs in person but they held. However, they weren't going to clear the woods this turn at least, already they were down by about 30% for no gain. Better late than never, Milne released Flowerdew's cavalry and he stormed forward in the middle. The Blue Lancers were surprisingly tough. Despite being hit by 2 squadrons they threw one back and then checked the follow up charge by the supports before rallying back with what was left. It would take a third charge to finally drive them off. While the cavalry fight was going on Red's infantry pressed forward and Blue's casualties slowly mounted. Finally it became clear that they did not have the strength to hold both the hills and the woods and a slow fighting withdrawal from the advanced positions began. In the centre the gun duel continued with the Navy easily ahead but the Blue gunners hanging in grimly. Milne gave the OK for the rifles to start moving up under cover to within rifle range. Huzzah! Taken with cold steel! Things were starting to look bleak for Blue. One hilltop had been lost along with all of the woods that covered the approaches and 1 of his 2 guns had been destroyed. Red's losses had been heavy but now his own were as well and his orders prevented him from shifting his last infantry reserve to the centre. It was at this point that Lord Snooty, the impartial foreign observer who often accompanies Blue, leaned forward and asked Scott if he had checked the Blue Reaction section. "What?" A quick check of the reaction chart followed by a die roll led to permission to disregard orders and react aggressively to any enemy foothold. "Ok boys! 1st Infantry: shift left to counter the enemy riflemen and reinforce the centre leaving the gun to hold the West Hill. Blue Dragoons: climb the hill and dismount to reinforce the Blue Guards." Casualties had been too heavy on both sides to risk any more bayonet or sabre charges except as a last resort. Milne ordered his field guns up and a fire fight between long lines of skirmishers backed by artillery followed. In the end, the dice averaged out, Red drew a Rally card that allowed him to recover a few hits, and as the light faded, Blue hit his army morale level. 8 out of 14 units destroyed or forced to retreat off table. But.......Red hadn't actually occupied the hills yet....... let's check the book again. The scenario says that no draw is possible so "discussions" continue to this day as to whether Red won or lost the day by breaking the enemy on the 2nd half of the last turn! Winnie at the Pass Pt 1. On Saturday General Milne got his chance to command HM forces in battle for the first time. Curiosity has brought Lord Snooty back into the field to report home on this new Red General. After several successful small scenarios from OHW I decided that I was in the mood for something a little larger. Not necessarily something with more figures but with more units, choices and depth that would play as quickly and easily but last a little longer without dragging. I briefly thought about Charge! and the NQSYW but I didn't feel like chasing 200 individuals about the table and haven't made my planned movement trays yet. Besides, the Pandour Grenadier company is about to be formed (new Hungarian Grenadier mold arrived Friday) and then they'll be eager to see action. However, that got me thinking about my table plans again. The idea for the current layout was that the 5x4 was big enough to handle 90% of what I want to do and it is, sort of. It is possible to play a small game on part of the table but because of the last minute height increase it is too tall for a sit down game which was one of the original criteria. Luckily for the last 6 months I haven't needed a sit down game but I'm not sufficiently optimistic that there will never again be times when I would really appreciate that facility. Since my removal of the 2nd desk I now have room to go back to the original plan of shifting the bookcase to the North wall and lowering the table. Of course, the table has grown since then so the question has become, leave it 4x5 or reduce it to 4x4 or 3x3 and have my modular expansion ready for bigger games once a month or so. As part of the shuffling and reassessing I found that I now have room to turn the table sideways with the 5 foot length against the wall. This would allow for a 2 foot extension to quickly give me a 5x6 upon demand, a size that is well proven as adequate for my occasional need for a bigger game surface to allow me to do a particular game, like the air & sea amphibious game last year. This in turn reminded me that I had made this table to allow for a 1 foot expansion to 4x6 but had never actually tried playing on it. I slipped in two offcuts lay some offcuts of thin plywood and cardboard, secured the lot with duct tape and decided I would have to forego the squares and throw my old ground sheet back on. 18 years of hard service at home and abroad (as in multiple HMGS cons and Huzzah), one refit, and still answering the call. Not bad for a cheap, on sale, end of roll, fabric remnant and a splotch of paint. Meg gets to fire in anger for the 1st time. I decided Broken Ground from CS Grant's Programmed Scenarios would fit the bill for this game and since the Tin Army (or whatever they end up being called) are supposed to work on or off grid I started picking forces. 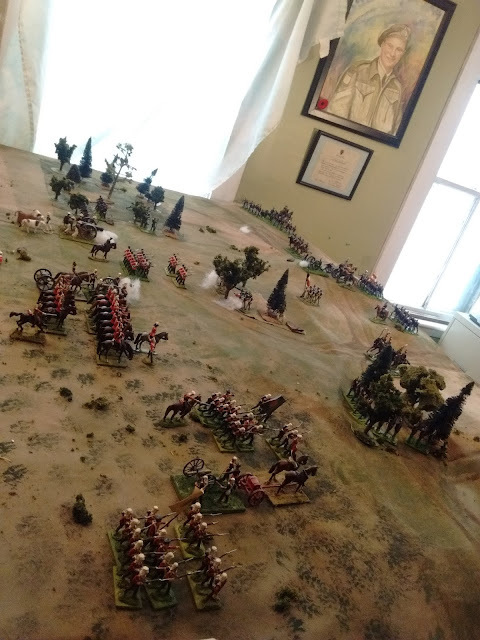 Having lost the last 2 games and having the least amount of infantry ready to go, Blue or Oberhilse was chosen to defend with 2 cavalry squadrons, 2 guns and 5 battalions totalling 11 companies of infantry. Red or Faraway attacked with 3 squadrons of cavalry, 3 guns and 4 battalions totalling 12 companies of infantry. The rules are still fairly ummh flexible, at this stage in their development and I gave each side 3 subordinate commanders with full command radius forgetting that as a stand-based replacement for MacDuff to the Frontier, there should have been 1 General plus a Colonel with limited command range for each battalion. A minor matter but might have given Red control problems on one wing. There was also some confusion as in a couple of the recent games as to what exactly constituted "a unit". Was it always a 2 stand "company" or was it sometimes a single stand of skirmishers or a formed battalion of any number of stands? I was playing without any written reference and was too engrossed in the game to bother checking so I wobbled now and then but ended up pretty close to the same conclusion as twice previously which is good enough for me. 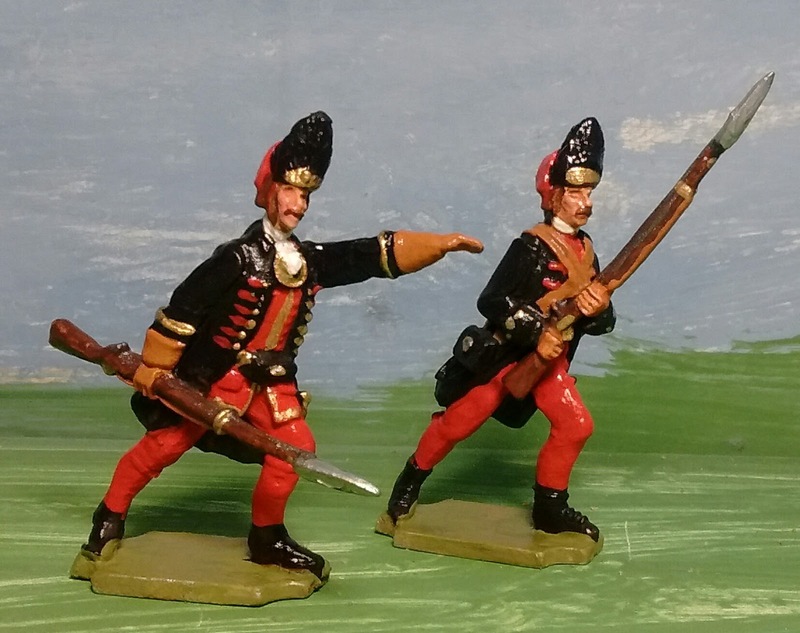 The 6 figure (infantry - 4 figure cavalry) "company" is the "basic unit" of the game to use Morschauser's term. 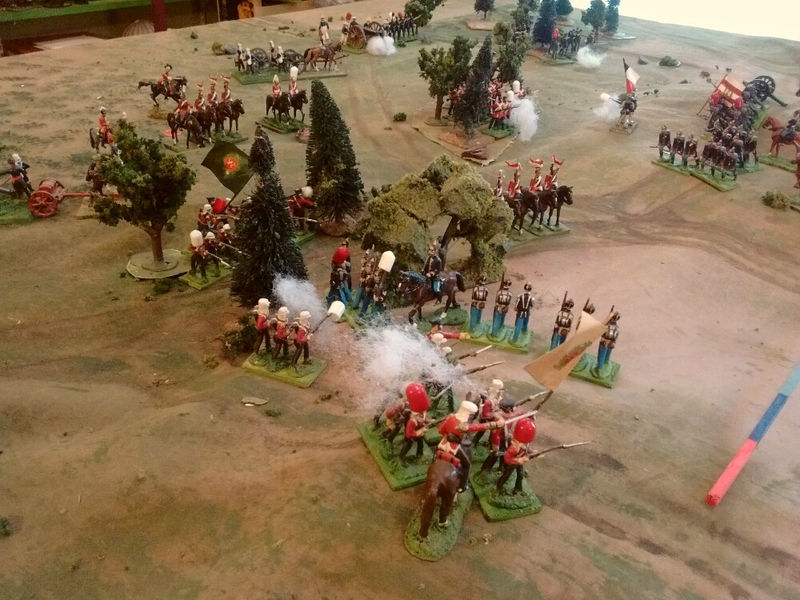 Rather than allowing any company to extend into a skirmish line and reform at any time, Companies may be broken into 2 "skirmish" or "light infantry" units when deployed either at the start of the game or upon arrival on table as reinforcements, or when committed from a reserve, and they may not normally be regrouped during the game. (There may be a special "regroup" option to allow units to merge.) Adjacent formed companies will have the same benefits on and off the grid and act as one in charge combat but I need to reword it for off grid play. "How did they game go?" you ask? "Well, ...Oh gosh, is that the time?" Broken Ground. Atlantica, yes but, where's the grid? NQSYW (semiflat 18thC) 471 men, 96 horses, 8 guns, 2 limbers, pontoon wagon. While I was at it I added the Elastolin Prince Valiant figures from the North Wall: 125 men & women, 30 horses, 6 centaurs. At the moment. That comes to a total of roughly 1,600 men and women and 283 horses. Most have been acquired by homecasting over the last 12 years after I decided to downsize from 54mm. (Now THEY knew how to fill up a shelf, they had 3 times the shelf space in my old room.) Not sure I'll bother counting the smaller lads since they take up so little room. More on the game on Sunday. May I introduce General Sir Alexander Alfred Milne, newly appointed to the command of HM's Faraway Field Force. The General (known behind his back as "The Great Pooh-ba" is a slightly modified Zinnbrigade 1900 Prussian artillery officer. If it doesn't move, paint it! Over the last few days I carried out the previously mentioned plan to remove the south wall shelves, move the bookcase, paint the sloping ceiling over them, and replace the shelves with a larger gap between them. As anticipated the white has appreciably lightened the room. Probably not enough to help much with photography, I need to lower the table to below tripod height for that, but enough to aid my eyes when looking for something and to make it just a bit more pleasant. Its taken a while to reload the top 3 shelves as i was sorting and considering options as I went. The top 3 shelves are now roughly in chronological order from 16thC on the left (off camera) to the Great War on the far right by the wall. Its not quite that simple though as the various collections don't always fit easily into the 3 tiers. 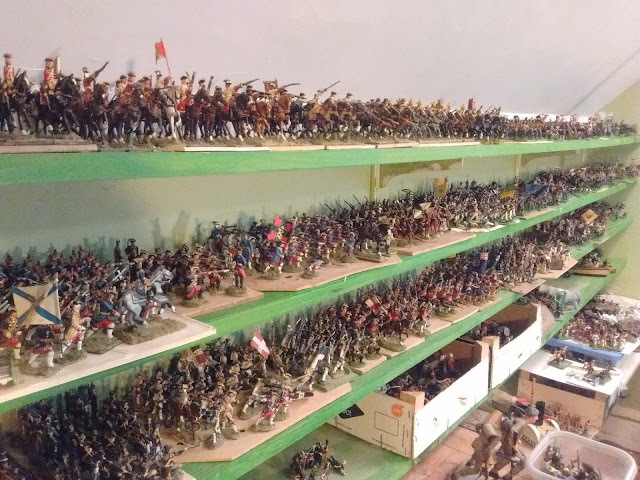 The 4th shelf is not yet filled and there are obviously more eligible 40 & 54mm figures than shelf space, esp considering troops awaiting reassignment not to mention the ones waiting to be painted. The same is true on the North Wall where Prince Valiant and the 25mm medieval/fantasy armies are hosted. Probably time to downsize again, esp as 100 new Elastolins are on their way or at least an update to my hobby plans for the next 5 years..
First though, it calls for an actual inventory, figures on active duty, figures in the active reserve in storage, figures in the inactive reserve in storage and existing figures waiting for reassignment, repair or disposal. Never mind the reserve pool of unpainted figures for now. Somewhere in there I'll take close up pictures of the shelves. Storm Day! Well, not much of a storm but good enough for me, I retired to my room. (Should I have a "nifty" nickname for my hobby room?) My intention was to paint but I had trouble settling in and suddenly thought "I want to play a game!" OK, then, what should I play? More of the same? Something different? Something easy? Yes, something quick and easy and something that hasn't been out for a while. I thought about NQSYW but pushing 200 individual figures around a table which is too small for them in their current state didn't appeal. Prince Valiant games kinda require a story line and write up which I didn't feel up to. Quick and easy did sound like I should haul out Thomas's book again. I flipped it open then turned pages until I found one I hadn't tried yet. The new light fixture doesn't seem to have helped much. On to Plan C.
"Scenario 23 Defence in Depth", inspired by Yellow Ford? Aha! 16thC English vs Scots should be close enough to feel at home. But... what about rules. I decided to try the Pike & Shot rules in the book. All the usual gripes occur. No artillery, ever? Really? etc But in general what he has and the explanation behind the rules all work so I figured I'd give them a go and started picking troops. The scenario calls for 4 units of defenders with 2 units swapped out for a scenario specific irregular light archer units. I picked a unit of Border Horse as Cavalry (in their minds), a unit of Highland Swordsmen and a unit of Highland archers as irregulars ..and...Hmm...out of Highlanders and damned well NOT borrowing English archers, Thinking back to an incident early in the Pinkie campaign when a group of Scots arquebusiers in a town blocked the English advance for a time, I decided to field arquebusiers for the 2nd irregular unit. 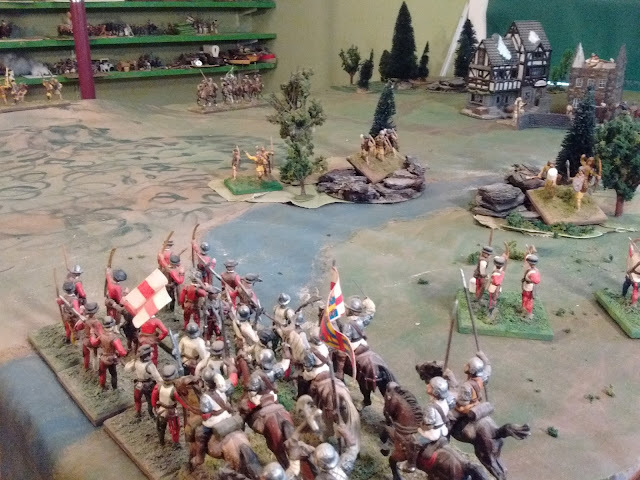 The English fielded 2 cavalry: 1 Border Horse and 1 demi-lancer not that it mattered, 1 unit of "swordsmen" (mixed sword & buckler and shot in this case) and 3 "infantry" with bills and bows. 1/2 an hour later I was rolling a die, tracking hits, rolling a die, tracking hits, daydreaming, rolling, wondering what to do for lunch etc until at long, lonnnng last the game mercifully ended with somebody or other winning. Ah! Looks like the English won. I'd forgotten. The markers here are black=4 hits, red=2, white =1. The Scots are all destroyed . I think the main issue for me was the small number of units which were rapidly locked in melee with no way to break off which left me with no decisions to make, no way to influence events, just rolling and recording and rolling and recording until 1 side was eventually removed. Nothing wrong with the rules really apart from not being my style. However, while the Pike & Shot rules which have a mix of the caracoling style of Reiters and pike and shot infantry seem acceptable from the French Wars of Religion on, (despite the lack of artillery) they are not really suitable for the late 15th & early 16thC , despite claims to the contrary. 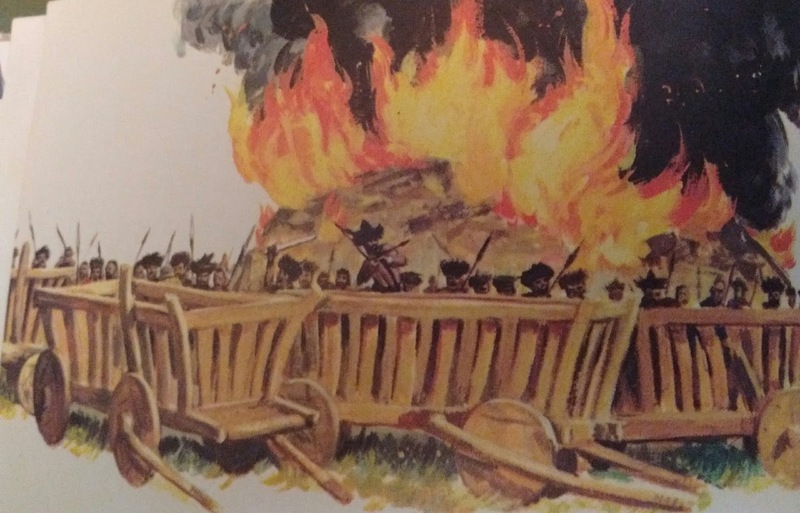 If I was to pick just 4 troop types for the earlier period it would be massed pike, separate skirmishing shot, gensdarmes and the artillery which played such a key role in battles like Marignano, Ravenna and Pinkie. I still felt the urge to have a fun game so I reset the table. Reset! The English send their cavalry and a regiment of Bills and Bows around by the flank this time while probing the rest of the line with bows and a few swordsmen. These armies were originally built to play with a Morschauser variant that Rob Dean & I put together called Rough Wooing. During the difficult years I poked and prodded at these until they weren't fun to play any more and have laid them aside. We are now working on a Morschauser based Medieval/Fantasy game which is struggling. I'd already been thinking about it and with a few notes scribbled down I set out to play the latest proposed Gathering of Hosts Rules (click). I kept the same number of stands but rearranged the English infantry into a more 16thC ish "Battle" with a block of bills and wings of bows plus a forlorn of swordsmen and archers. After several turns of play the English were crying Foul! and claiming that Scots must be using loaded dice. Since I was rolling for both sides with the same dice I dismissed the claim out of hand but it was rather alarming while it lasted. In this game white markers are 1 hit and red are 2. All units normally take 4 hits with Elites (of which there were none) taking 5 and Levies etc (the 2 Scots "Irregulars") only taking 3. And yes those archers in the foreground are on their way home. The Scots went from triumph to despair and back again several times. 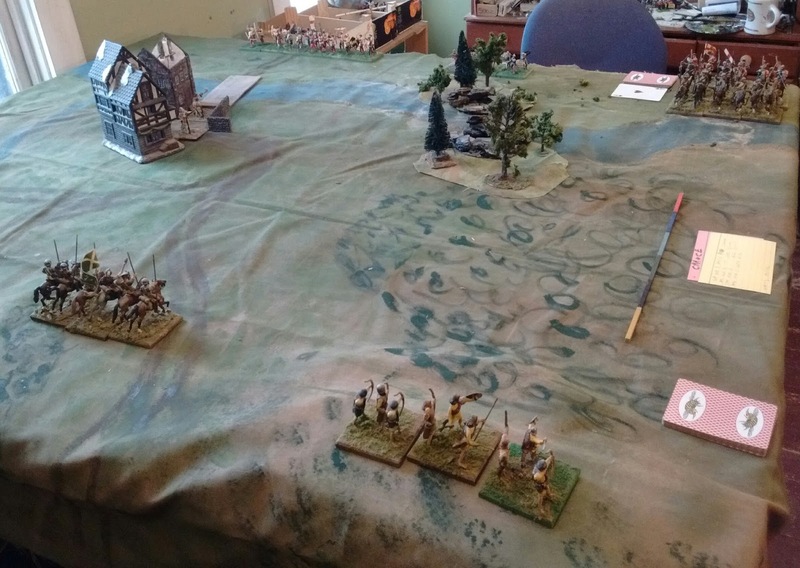 Early on their irregular archers and shot caused massive casualties shooting from cover with about a 50% rate of 5's and 6's on their dice while the return fire for 6's vs cover barely hit all game. 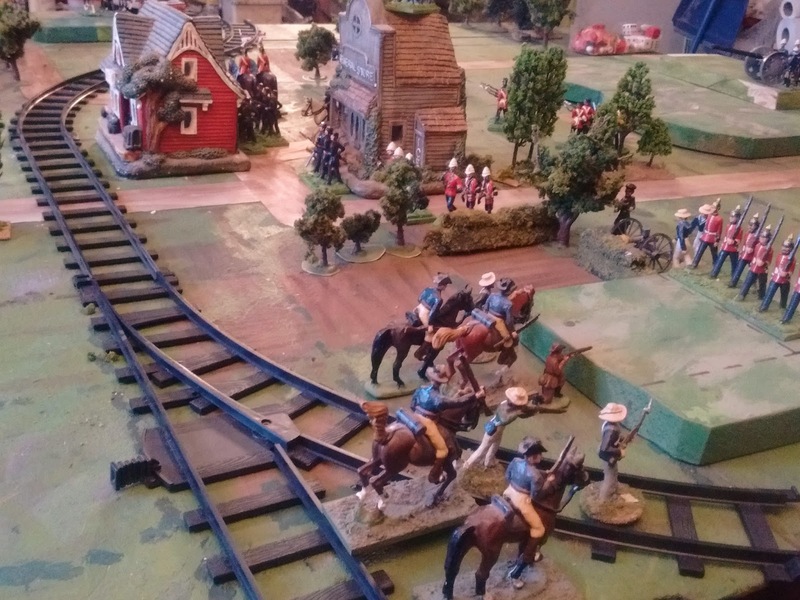 By turn 8 of the 15 turn game the remnants of the English Forelorn had given up on the bridge and were heading around while the main body had pushed forward, infantry vs the hill, cavalry vs cavalry on the plain. They were having a hard time of it though, not helped when archers and shot started turning up in their rear to take pot shots. 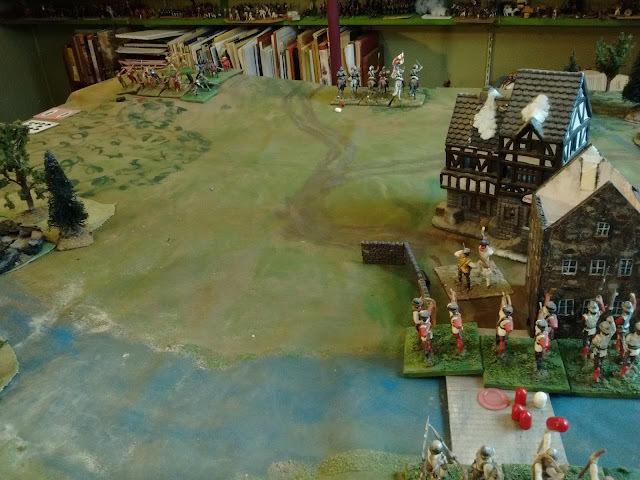 In fact the English were only a stand away from reaching their army break point while the Scots had hardly lost anyone. Speaking as a Macfarlane, it looked good! Alas, Lord Dacre must have found a way to inspire his riders. 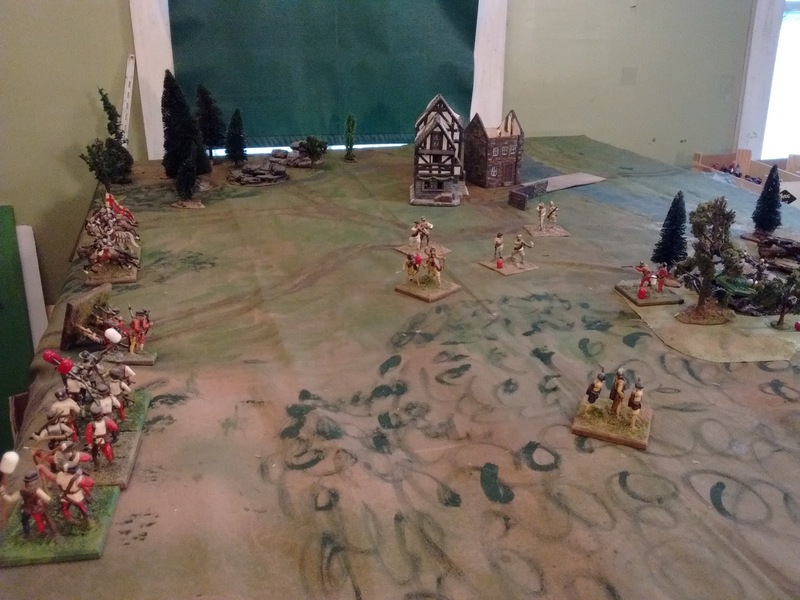 After 3 turns of a running fight with the Scots who kept breaking contact and falling back, the English charged back in and the whole Scots cavalry broke and vanished from the field. 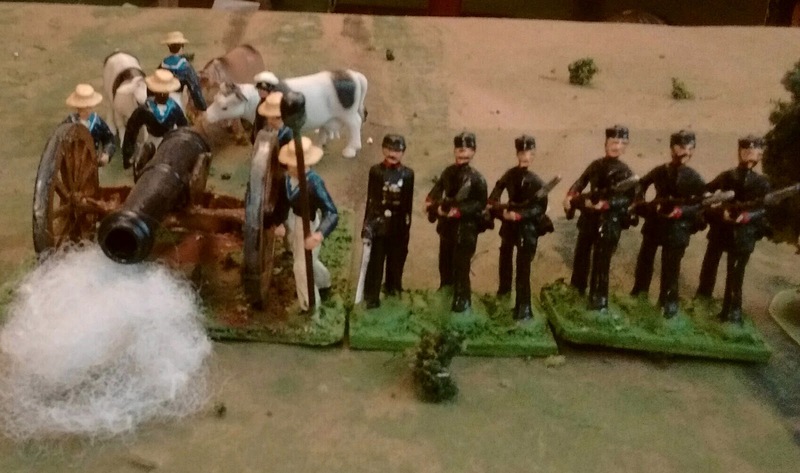 At the same time, on top of the hill, Angus went down with 1/2 of his men. Now both sides were 1 unit away from breaking. Scots initiative. 1 hit from archery! And a bucketful of 1's. Oh dear. They are still there. English turn, Down goes the last Highland swordsmen, away run the levies! The way is clear with nothing between the English and the board edge. "Huzzah! Did I mention that my mother's mother was a Wright? " I should take a picture. kinda missed the last 8 turns. The English lining the board edge have actually left the board. The English in the woods are bracing for the race to the finish line while the Scots in the open are heading home for a wee deoch after a hard day's work. Oh but wait, "must exit 3 units (9 stands) by turn 15". Oh dear, The English have only straggled off with 7. 9 have been destroyed. They need the 2 wounded Forlorn Hope guys in the woods. Three turns to go, they advance, they run, they reach.... within a spit of the board edge, and.... the sun is down! Too late! No wonder the Irregulars took off, their work of delaying and weakening the English was done. "Scenario inspired by Yellow Ford you say? Did I mention that my father's mother was a Milligan?" The apocryphal last words of General Brock at Queenston Heights would have been referring to militia from what is now Toronto and may not seem relevent but please bear with me. As I set about the next company of Volunteers I was lamenting that the only way of distinguishing them was by using the 1861 pattern pointed cuffs vs the less common earlier 1856 pattern used by the Fort Henry Guard and my 1st two companies. Unfortunately, it seems that any Canadian infantry not dressed as Rifles were assigned blue facings. Luckily, in those pre-confederation days, the three Maritime colonies had their own governemnts and militia and the New Brunswick county regiments used different facings for each battalion as well as having volunteer rifles in light grey, as did Nova Scotia. #1 company of the York Light infantry. According to David Facey-Crowther's book on the subject, the 3rd battalion, York County Militia, aka York Light Infantry, wore yellow facings. Yellow is good. They also had an African Canadian company for a while, these were probably pioneers. I already have a company of black pioneers from Canada but I'd be happy to issue rifles to them and send them in with the rest. Lastly, as far as I can figure, the area near Fredericton where my brother built his house in '79, across the river from King's Landing (the recreated history site not the GofT place, looks a lot like Faraway) and where my neice now has an old farm, would have been in its recruiting area. Close enough for me. Faraway now has York Volunteers of its own. Steps along the way, L to R, nekked master dolly (2005) used for various other figures, Canadian militia master (2013) modification of one of the 1840's figures based on the dolly, new casting (2016). I was going to write something about the rules but find that I have nothing much to say! I might again note that transforming notes from a successful test game into a coherent, intelligible quick reference is one of the areas where I am all too liable to go astray. 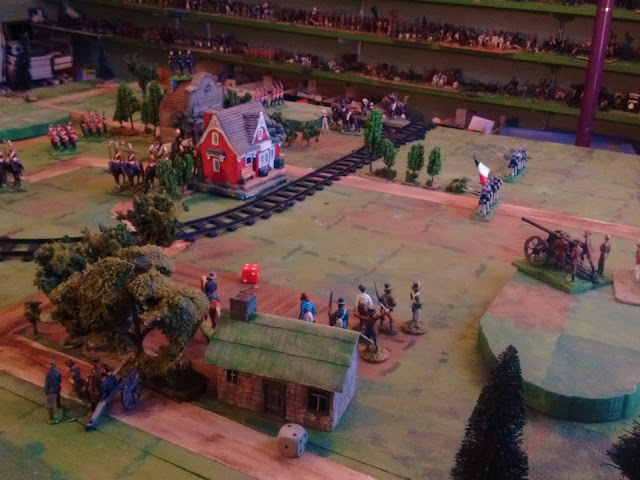 At the end of the day, the last game was played with something so close to the pre-Great War Diversion version of the Square Brigadier as used in 2014 for the Nine Years War and 54mm Cut Knife Creek games, that there is no need for a new name or explanation of new features, just a replacement of the accidently purged rules. I am making the draft quick reference available for the curious but it is not yet complete or thoroughly proofread. The 5 page version that explains things is no where near ready and probably won't be until after 5 or 6 more games have been played. Already in progress are the last 6 York Volunteers and an 1860's General. He's in full dress Toy Soldier style inc cocked hat rather than the more realistic campaign dress but at least I'm not going with the jackbooted Field Marshall with foot wide handlebar caricature that commanded in the page of Little Wars. I was tempted. After that, its time for a change. I might go with NQSYW for which I have 2 1/2 finished units and more molds en route. At least playing Charge! would avoid rules fiddling. or the 16thC which doesn't get out much or the Elastolins. I did in fact find time on Sunday evening to play through this scenario. It went OK and I meant to write it up on Monday but what with this, that and the other, what time I had was spent rethinking the approach, arguing with myself and checking various references, freeing myself once again from the scale demon then refighting the scenario using a slightly tweaked version of the Tin Army which so pleased me in the Kapelle game last June. Turn 2. The artillery is trading fire at long range and Blue has started to redeploy his forces. I'm sure the Tigers and Buffs were muttering about having stormed and taken this same bloody town on Sunday. Ferozepur is it? The game follows on from the last one where Red won a technical victory. The general idea was that Blue had fallen back to a defensive position which a reinforced Red would attack. I was looking for a small scenario which would be quick to play but didn't want another encounter scenario or anything to do with rivers or one that I had fought a zillion times. I was resigning myself to plopping a hill down in the middle of the table and just going from there when I thought about Thomas's OHW. Surely there must be something in there. It was a struggle, esp since so many are stripped down versions of familiar Grant Teasers but I came across this one inspired by a Panzer Blitz scenario and figured it would do. The forces are equal but the defender has to allocate 1/3 of his resources to each of 2 distant objectives while the attacker can focus on 1. I might or might not have once played the Panzer Blitz original but it was close enough to something different and I was off. Oberhilse (Blue) Rolled up 3 infantry (4 stands each), 2 guns and a cavalry unit (2 stands). They posted 1 infantry and a gun in and around the town and the same on the hill in the far corner. 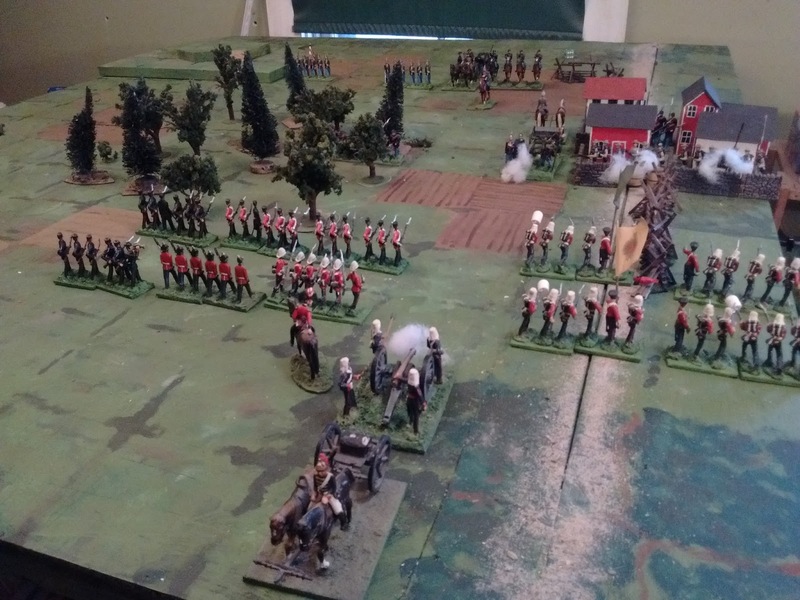 The cavalry and other infantry unit hovered in the middle. Faraway (Red) Rolled up 3 infantry, 2 elite infantry and a gun. The hill looked like the most vulnerable target but I made myself roll: 1-4 attack the hill, 5,6 attack the town. Yup, inevitably 5. I deployed the elite Tigers and Buffs to attack the town (and promptly forgot the elite status), the gun in the gap and the rest of the infantry to clear the wood, support the gun and act as a reserve. I shuffled out a deck for 12 turns maximum and set to. A few turns later, maybe turn 5 or 6? Blue's artillery has been forced back to avoid destruction while the Tigers have captured the white house. Casualties amongst the attacking force have been high though. Apart from the volunteers that is, especially the ones out of LOS and thus control of the General, the ones who have downed packs and are brewing up in the middle of the wood. 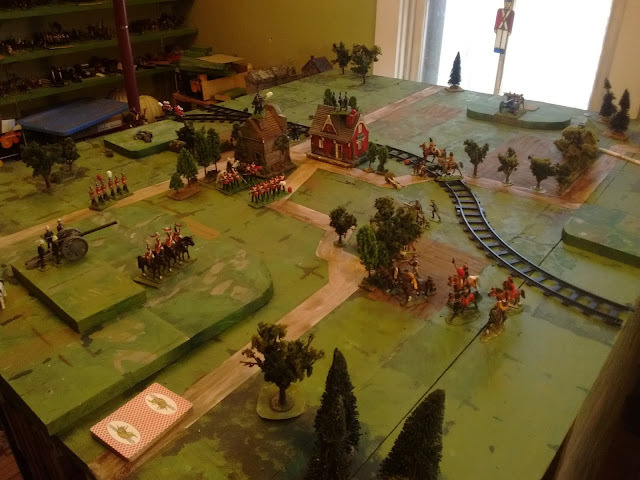 A dashing attack by cavalry on the volunteers which just chased away the gun was forestalled by Red pointing out to Blue that the scenario requires that he keep at least 2 units within 4 squares of the hill. Eh? Damnnation! An hour later I reached a breathless conclusion after some close calls and tense moments, walked downstairs and was somewhat surprised to see that 2 hours had gone by. I don't usually take an hour to walk down the stairs so it might have taken me somewhat longer to play the 12 turns than what it felt like. However 2 hours is a good game length for me. I can see a full divisional game lasting twice that or more. Turn 11. 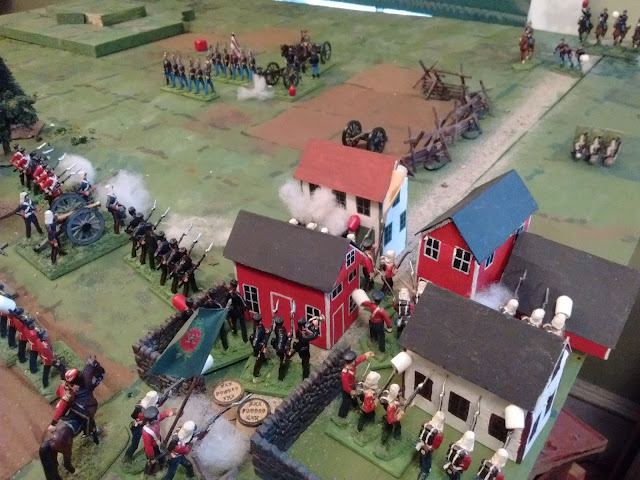 (Cameraman must have been preoccupied) Red has slowly cleared the town and has then repulsed 2 forlorn counter attacks by infantry and dismounted cavalry. Every unit has stretched as far as it can go but Blue has lost 7 out of the 8 companies of infantry that were engaged as well as one of his guns and no one is close enough to renew the fight even if they wanted to. Blue's 7th infantry who watched the battle from afar are probably feeling a mix of relief and guilt that they got off scot free and are available to cover the retreat. OK so what's next? 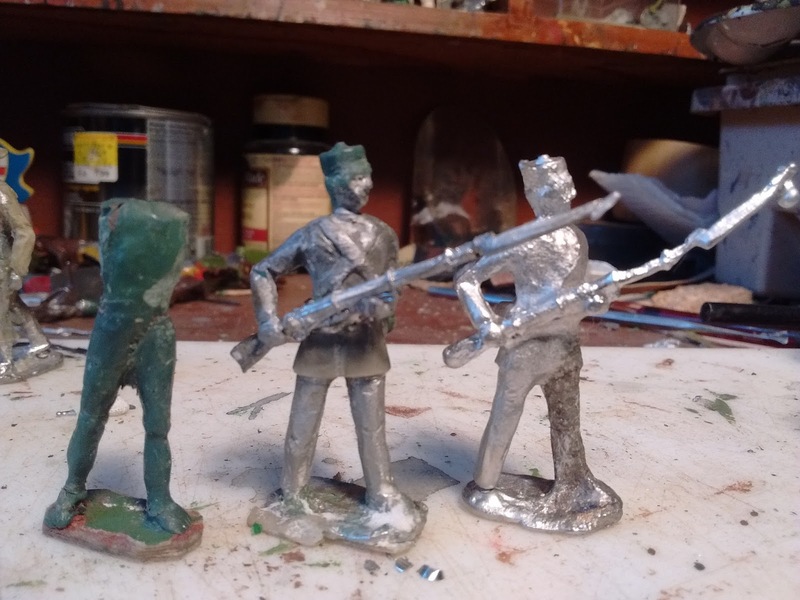 A post discussing the rules naturally and at least a quick reference summary but there are more troops to paint as well as limbers, bands, hospitals, command groups, engineers and some slightly bigger, hollow, buildings to make. Buildings with a lift off roof and able to hold 2 stands while only taking up half an area so that a road can run through the town as with these solid ones. And more! Much more!